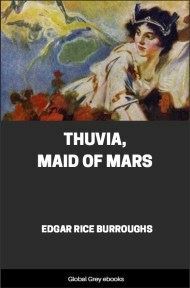 Thuvia, Maid of Mars is the fourth book of the Barsoom series. 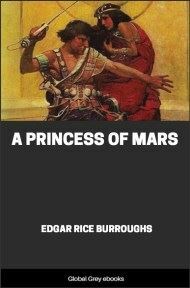 In this novel the focus shifts from John Carter, Warlord of Mars, and Dejah Thoris of Helium, protagonists of the first three books in the series, to their son, Carthoris, prince of Helium, and Thuvia, princess of Ptarth. Helium and Ptarth are both prominent Barsoomian city state/empires, and both Carthoris and Thuvia were secondary characters in the previous novel. Its plot devices are similar to the previous Martian novels, involving the kidnapping of a Martian princess. Upon a massive bench of polished ersite beneath the gorgeous blooms of a giant pimalia a woman sat. Her shapely, sandalled foot tapped impatiently upon the jewel-strewn walk that wound beneath the stately sorapus trees across the scarlet sward of the royal gardens of Thuvan Dihn, Jeddak of Ptarth, as a dark-haired, red-skinned warrior bent low toward her, whispering heated words close to her ear. "Ah, Thuvia of Ptarth," he cried, "you are cold even before the fiery blasts of my consuming love! No harder than your heart, nor colder is the hard, cold ersite of this thrice happy bench which supports your divine and fadeless form! Tell me, O Thuvia of Ptarth, that I may still hope—that though you do not love me now, yet some day, some day, my princess, I—"
The girl sprang to her feet with an exclamation of surprise and displeasure. Her queenly head was poised haughtily upon her smooth red shoulders. Her dark eyes looked angrily into those of the man. 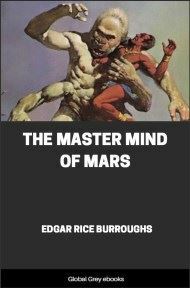 "You forget yourself, and the customs of Barsoom, Astok," she said. "I have given you no right thus to address the daughter of Thuvan Dihn, nor have you won such a right." The man reached suddenly forth and grasped her by the arm. "You shall be my princess!" he cried. "By the breast of Issus, thou shalt, nor shall any other come between Astok, Prince of Dusar, and his heart's desire. Tell me that there is another, and I shall cut out his foul heart and fling it to the wild calots of the dead sea-bottoms!" 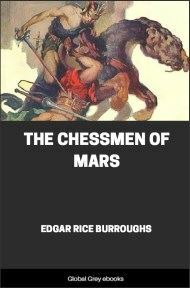 At touch of the man's hand upon her flesh the girl went pallid beneath her coppery skin, for the persons of the royal women of the courts of Mars are held but little less than sacred. The act of Astok, Prince of Dusar, was profanation. There was no terror in the eyes of Thuvia of Ptarth—only horror for the thing the man had done and for its possible consequences. "Release me." Her voice was level—frigid. The man muttered incoherently and drew her roughly toward him. "Release me!" she repeated sharply, "or I call the guard, and the Prince of Dusar knows what that will mean." Quickly he threw his right arm about her shoulders and strove to draw her face to his lips. With a little cry she struck him full in the mouth with the massive bracelets that circled her free arm. "Calot!" she exclaimed, and then: "The guard! The guard! Hasten in protection of the Princess of Ptarth!" In answer to her call a dozen guardsmen came racing across the scarlet sward, their gleaming long-swords naked in the sun, the metal of their accoutrements clanking against that of their leathern harness, and in their throats hoarse shouts of rage at the sight which met their eyes. But before they had passed half across the royal garden to where Astok of Dusar still held the struggling girl in his grasp, another figure sprang from a cluster of dense foliage that half hid a golden fountain close at hand. A tall, straight youth he was, with black hair and keen grey eyes; broad of shoulder and narrow of hip; a clean-limbed fighting man. 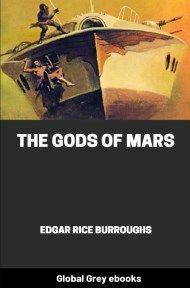 His skin was but faintly tinged with the copper colour that marks the red men of Mars from the other races of the dying planet—he was like them, and yet there was a subtle difference greater even than that which lay in his lighter skin and his grey eyes. There was a difference, too, in his movements. He came on in great leaps that carried him so swiftly over the ground that the speed of the guardsmen was as nothing by comparison. Astok still clutched Thuvia's wrist as the young warrior confronted him. The new-comer wasted no time and he spoke but a single word. "Calot!" he snapped, and then his clenched fist landed beneath the other's chin, lifting him high into the air and depositing him in a crumpled heap within the centre of the pimalia bush beside the ersite bench. Her champion turned toward the girl. "Kaor, Thuvia of Ptarth!" he cried. "It seems that fate timed my visit well." "Kaor, Carthoris of Helium!" the princess returned the young man's greeting, "and what less could one expect of the son of such a sire?" 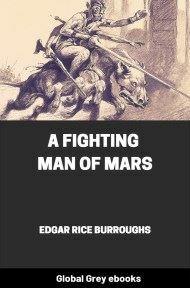 He bowed his acknowledgment of the compliment to his father, John Carter, Warlord of Mars. And then the guardsmen, panting from their charge, came up just as the Prince of Dusar, bleeding at the mouth, and with drawn sword, crawled from the entanglement of the pimalia. Astok would have leaped to mortal combat with the son of Dejah Thoris, but the guardsmen pressed about him, preventing, though it was clearly evident that naught would have better pleased Carthoris of Helium. "But say the word, Thuvia of Ptarth," he begged, "and naught will give me greater pleasure than meting to this fellow the punishment he has earned." "It cannot be, Carthoris," she replied. "Even though he has forfeited all claim upon my consideration, yet is he the guest of the jeddak, my father, and to him alone may he account for the unpardonable act he has committed." "As you say, Thuvia," replied the Heliumite. "But afterward he shall account to Carthoris, Prince of Helium, for this affront to the daughter of my father's friend." 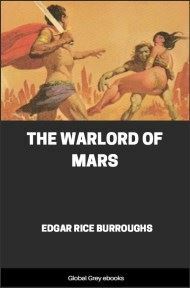 As he spoke, though, there burned in his eyes a fire that proclaimed a nearer, dearer cause for his championship of this glorious daughter of Barsoom.